Overcrowding or Not? 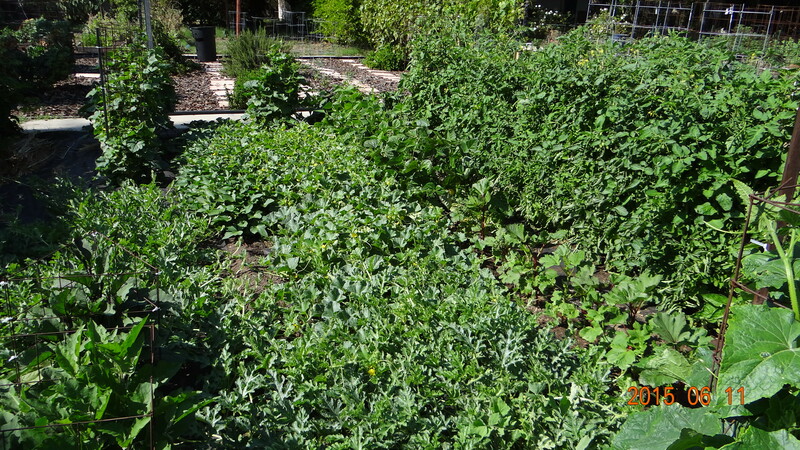 We planned the garden with the intent to not waste any space, but at the same time not overcrowd the garden. We had some unknowns about how far the vines would run for the watermelons, cantaloupe and sweet potatoes. We also were willing to risk having them grow together a little bit with the hope that they would not over compete with each other. 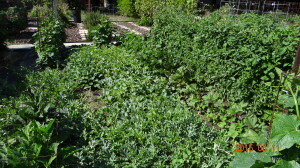 We also expect that we will remove the cantaloupe and water melon vines before the sweet potatoes are finished growing. We are also hopeful that the taller Greenbeans, Eggplant, Cucumbers and Okra will tolerate the shorter vines growing around them. Their source of water and nutrients is still the point of planting, so the main completion will be for light and air movement. Things may be getting out of hand, but it is still too early to tell. We will have to see what kind of a melon set we achieve as things are, if we create a disease fostering environment, or if the vines expand to the point where they reduce light penetration to the other garden plants.